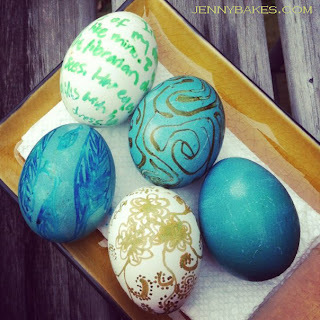 I've been pinning interesting egg ideas to my holiday Pinterest board for months, and many of the Easter pins have to do with using natural dyes for eggs. I was planning to do blue-gray and blue, but forgot I used the rest of the frozen blueberries in smoothies (new blender, it's a compulsion). In the end, I only made one color, but was very happy with the results and will be doing more of this next year! Step 1: Boil eggs. Martha Stewart says you can actually boil the eggs in the strained natural dyes, so you can take that into consideration. That isn't how I did it. Step 2: Prepare natural ingredients. I roughly chopped half a red cabbage and simmered it in water for 15 minutes. I let it cool then added 1 tbsp vinegar. 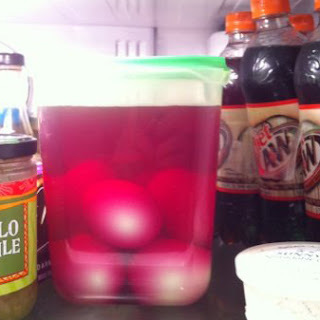 Step 3: Soak cooled eggs in cooled natural dye overnight in fridge. I stirred my container a few times because I noticed white spots where they were touching. My container may not have been ideal. 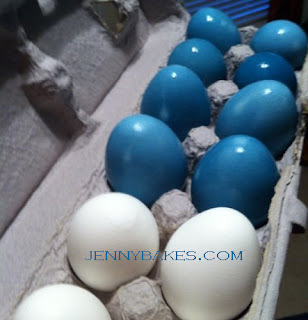 Step 4: Gently wipe eggs and let dye dry. This could be a fine place to start, as the colors are vibrant. But I had some other ideas. Step 5: Draw on eggs with food-safe markers. I used the foodoodler markers I had previously purchased from King Arthur Flour. The moisture on the eggs was a problem, and many of the designs were smudged. But those that dried looked pretty amazing. The white one with words has the beginning of the poem "Eating Poetry" by Mark Strand. Tomorrow is the start of National Poetry Month, so I've had it on my mind. 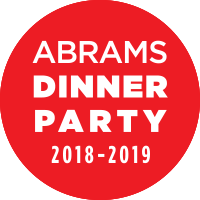 Although the Food Network and I aren't really friends anymore, since they seem only want to teach me how to use processed food or to host reality television, I have found a new friend in the Cooking Channel. Actual chefs, making things from scratch, and I've been learning things. One show I adore, even if I only watch the beginning to get the general idea most of the time, is Brunch at Bobby's. Bobby Flay is the real deal. Even when he made strawberry shortcake milkshakes, he startsby making shortcakes from scratch. No excuse about not being a baker, no time-saving tricks like buying pre-made shortcakes with a kitchen-sponge texture, just a quick demonstration of how easy biscuit making can be. Anyway, one day he made what looked amazing - Chocolate Blintzes with Chocolate-Whipped Ricotta Almond Filling and Warm Cherry Sauce. The entire episode was about a chocolate lovers brunch, and I started thinking how I could adapt this recipe to a lower-sugar version. And I did. And it was good. So now I share it with you. The only regret I have is that had I had frozen unsweetened cherries on hand, it would have been easy to make a lower-sugar sauce version, but since I didn't, I used thinly spread jam inside the crepes. And honestly, this was one of the rare moments in our lower-sugar eating that didn't feel like a big sacrifice. If you start with a good flavor profile with a lot of layers of texture and flavor, the way Bobby Flay always cooks, then it is easier to bridge the gap even when you are having to pull back on a few ingredients. 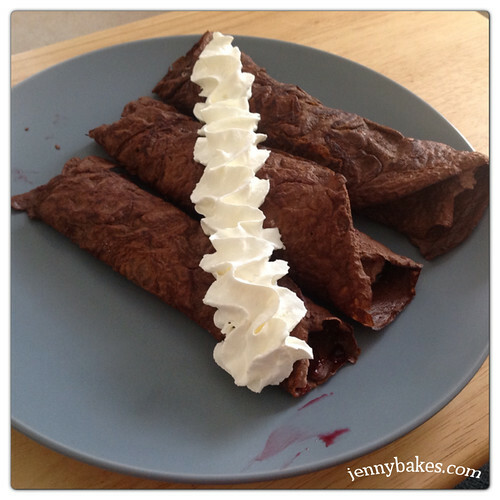 I started with the lower carb crepes recipe that often finds its way onto our weekend menu, and made a few tweaks. I added 1/3 cup cocoa powder and 3/4 cup-1 cup of unsweetened almond milk (to partner the almonds in the filling), and gave it a go. The crepes were a little thicker than normal, but tasted chocolatey and were still rollable. I used Bobby's ricotta filling recipe, but added a few tablespoons of almond flour, 1 tbsp of chocolate chips, and used splenda instead of powdered sugar. I already said I used a thin layer of jam inside, whipped cream on top, and these were great. Next time I'll make a fruit sauce or add fresh fruit. One of my goals for the year was to not forget Pi Day. What kind of baker forgets Pi Day? Well, I forgot Pi Day. Almost. At 8 pm, I decided I couldn't just let it go by, and that I should make pie based on what I had no hand. 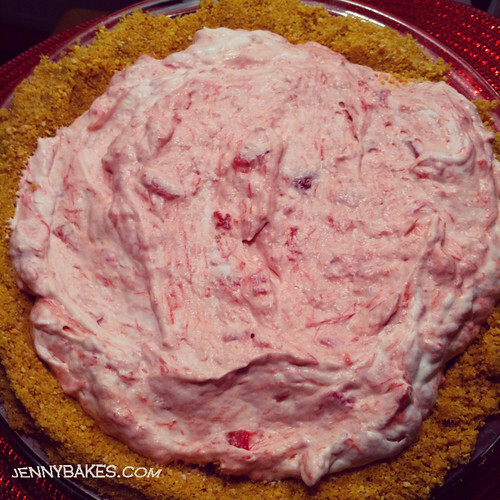 That included rhubarb, only one stick of butter, no eggs, and little patience. I stumbled across a recipe for Foolish Rhubarb Pie on ScienceBlogs.com. Well, if it is science, I might as well trust it! I adapted it to make it slightly lower sugar, by using brown sugar Splenda blend instead of brown sugar, using half hazelnut flour for the graham crackers, and cutting back on the rhubarb a bit (only because I only had 3/4 lb.). Fool is tasty. In my opinion, it doesn't need crust. But without crust, would it be a pi(e)? Well, for this one day a year, we'd better not chance it. The Pi(e) Day of all Pi Days will of course be 3/14/15, so we'd better start planning for two years from now!